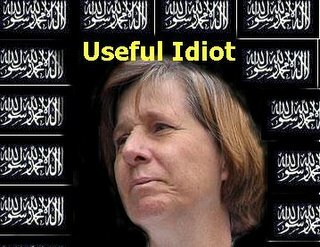 Quisling, left-wing wacko and all around moron Cindy Sheehan returned from her meeting with South American thug Hugo Chavez to annouce that she is considering challenging Diane Feinstein for her seat in the US Senate. All I can say is RUN, CINDY, RUN!! The true face of the Democratic Party in 2006 should put her money where her mouth is and throw her hat into the ring. It is the perfect win/win, even if it would not result in the election of a Republican from California it would give us a traitorous schmuck that would ammount to the gift that keeps on giving. Again I say…..RUN, CINDY, RUN!!!! !